Dave is flying solo this week as Caroline isn’t feeling well. As a result the show format goes all to pot, but he still plays some great music. 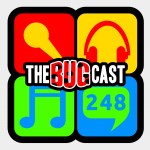 The next show will be episode 249, which will be broadcast live in the chatroom on Friday 8 February 2013 from 21:30 UK time.